Through the work of three artists from the Gallery’s collection, this exhibition explores the connections and disjunctions of travelling in ‘strange lands’ and recording photographically what is thought, seen and experienced. Australian documentary photographer Max Pam has travelled extensively throughout his 40-year career, primarily in Asia. His work is driven by the desire to successfully record and visually resolve the immediacy of his experiences and the momentary collision of otherness that travel affords. 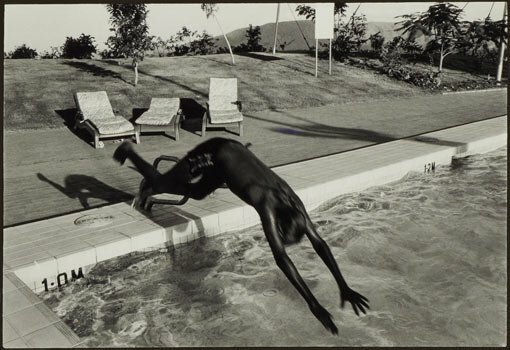 Jon Rhodes has dedicated much of his photographic career to documenting Australian Indigenous culture. Living with communities for extended periods of time, Rhodes develops sustained relationships with his subjects. His photographs are often displayed in sequential arrangements that weave narrative connections between adjacent images. Micky Allan’s My trip is a publication she produced in the 1970s when she undertook a 17-day road trip through rural Victoria. Choosing to photograph everyone she met and then invite them to take their own photograph, Allan used the camera to mediate her interactions with strangers. The publication does not simply record her personal experience on the road but also catalogues the public perception of a woman travelling alone during the active years of second-wave feminism.